This game is incredibly fun. Finally got a chance to play it for the first time today. 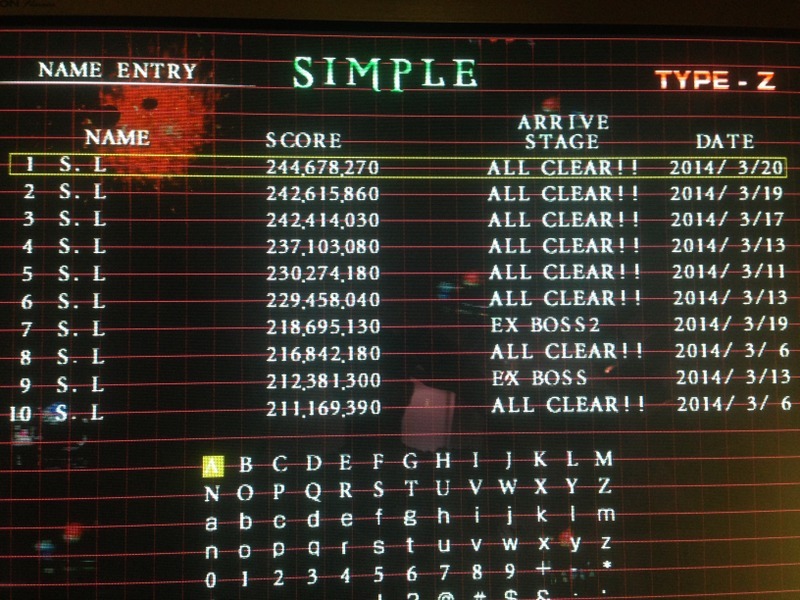 Was definitely not expecting to get a Simple mode clear, especially since I had no idea what I was doing! There has been some friendly competion around CC on the french forum, it's very motivating! Hope the hype will move to Original or Unlimited ! 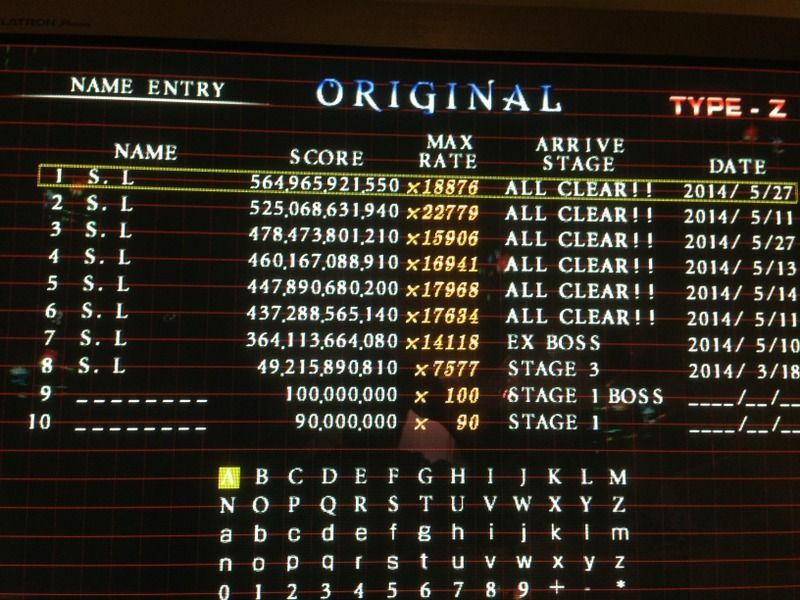 -S.L- - 2億3710万3080 - ALL CLEAR!! 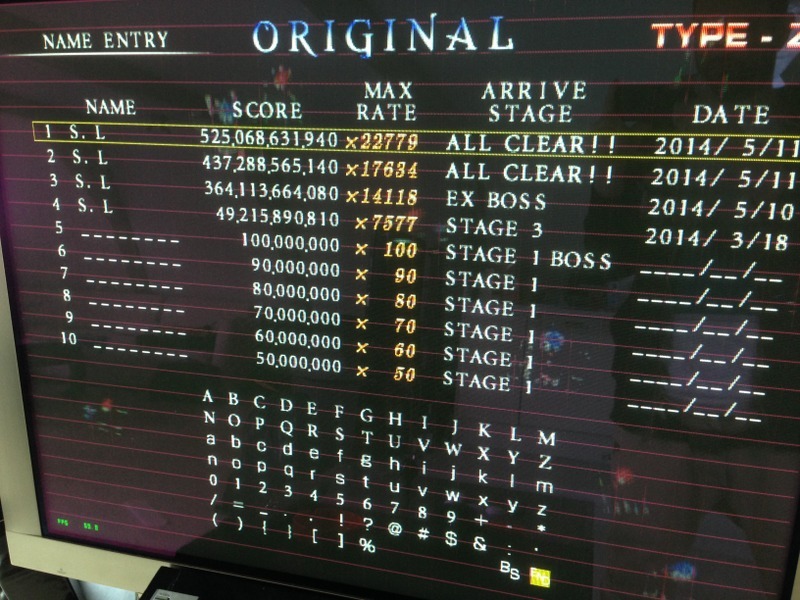 -S.L- - 2億4467万8270 - ALL CLEAR!! -S.L- - 2億5921万4410 - ALL CLEAR!! -S.L- - 2億6136万2960 - ALL CLEAR!! Now 7 millions away from the Western Record ! 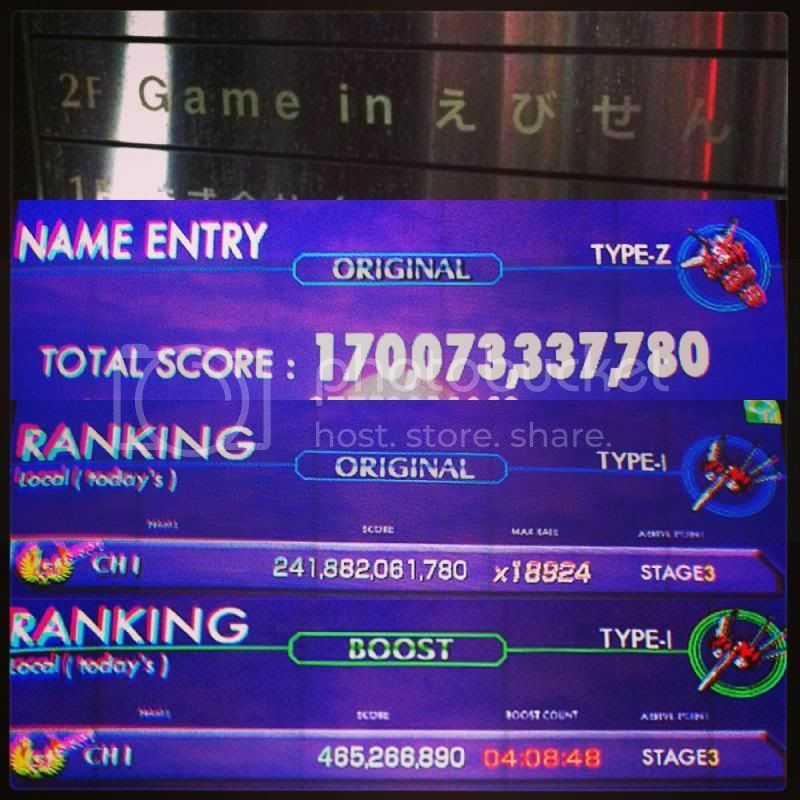 -S.L- - 2億6736万1510 - ALL CLEAR!! 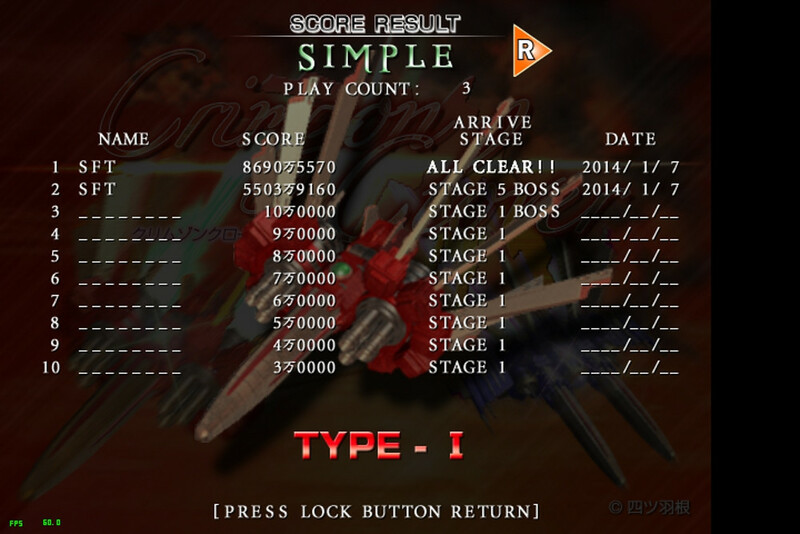 Try using Type I to get the Simple Mode western record. 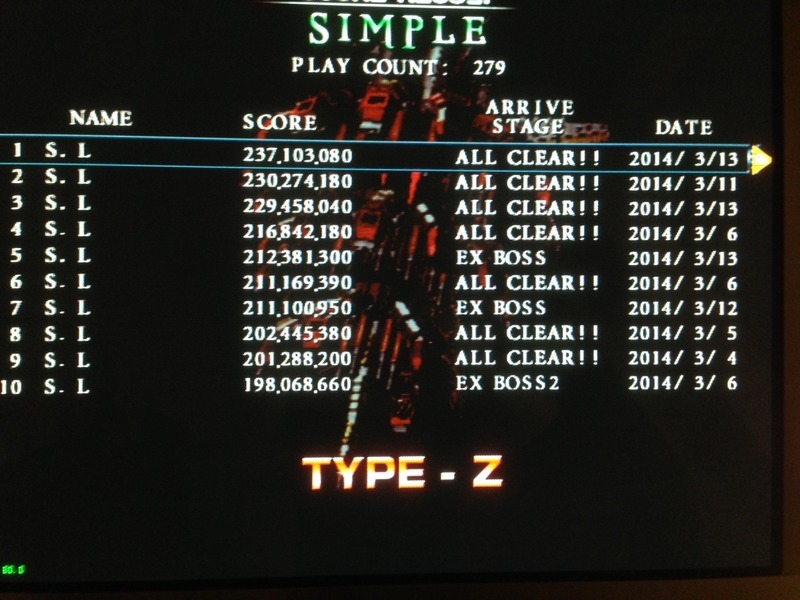 IF i beat the 268 millions with Type Z, it is not considered as Western Record all of type ? Would you recommend playing Type I to get higher score ? 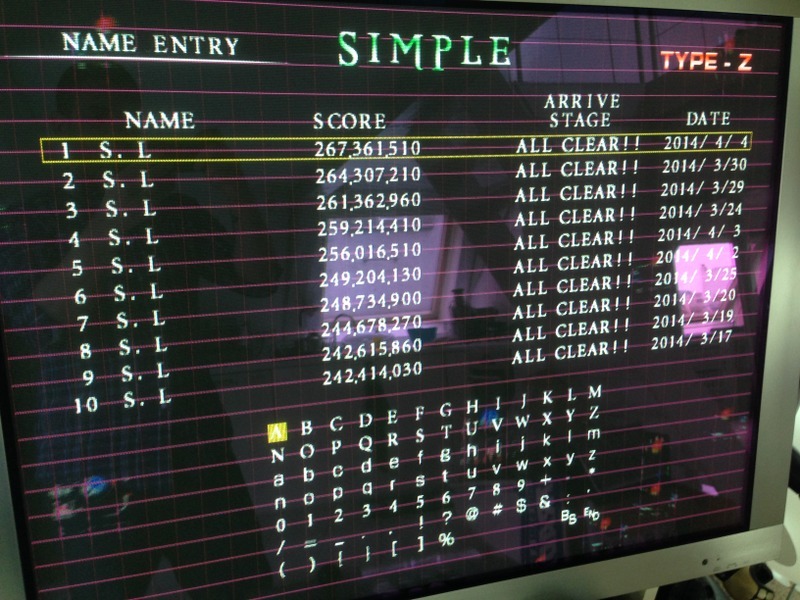 It may be, but note we don't have consolidated tables, so your score would still be considered the Simple Mode, Type Z western record here. And you're already top of that board. But anyway, good luck. Aim for the currently known WR of 300mil+ - done with Type I.
I agree that Type Z is completely over powerful compared to the two other types. I like it because it's fast more than powerful, for instance, I play type III on Nesica instead of Type Z, it's really fast, but not powerful as Z, and its Lock On is pretty slow too. 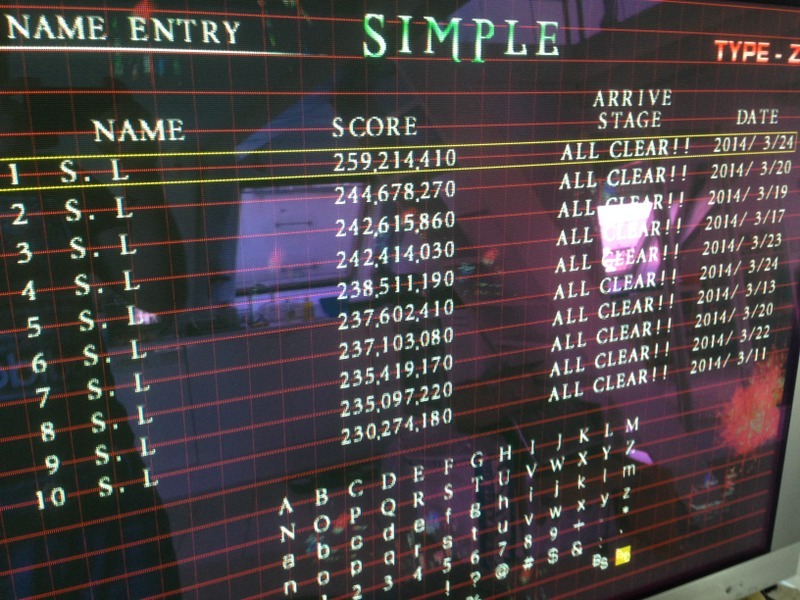 Now that said, I do agree that it's much more impressive to clear and make a high score with the "weak" types, but I think (I might be wrong) but there are couple of games that their official WR are actually made with the strongest (not too say cheats ship), especially with some Psykio games, and probably more. Yes I'm preaching for my church - now once I'll beat the 268 millions target with Z, then I'll force myself to play Type I (I actually prefer Type II), and see what I can do with it. I actually have one technical question for you, don't you think that because Type I is less powerful, it takes longer to kills enemies, and therefor, leaching big ones will bring slightly more point because of the bonus while shooting at them ? That is pure speculation, I was just wondering. Oh and now talking about unlimited, WR is, if I'm correct made with Type Z with something like 2.000.000.000.000, so are people still consider this as cheating and more impressive with Type I or it is fine to say "ok, type Z is THE ship for Unlimited so we accept this as a WR"
Both the known WR and the 3.9兆 TAS are with Type Z. However, I personally believe that you can score almost as much with Type I, if you have a good route. Type Z's power and recharge speed makes things far easier to deal with, regardless of mode. Unlimited balances things out with the difficulty, but the ship is too overpowered in Original and Simple. Ok so we both agreed regardless that Type Z is stronger (we all knew that) but it remain unclear that Type I or Type II should be used to get the WR / Western Record and have it official. Last edited by -S.L- on Sun May 11, 2014 4:31 pm, edited 1 time in total. Last edited by -S.L- on Sun May 11, 2014 4:32 pm, edited 1 time in total. My third game only on Original. Might as well post this now. Will probably try to improve it before World Ignition comes out. Did this a week before Stunfest during a demonstration training stream. Approximately 9750oku is attainable if I total up my sum of personal bests for each stage, though I really want to optimise stage 2, 3 and 5 to break the 1chou barrier. What's really funny is the demonstration at Stunfest I cleared with Lx6, a personal best extend count finishing the game. 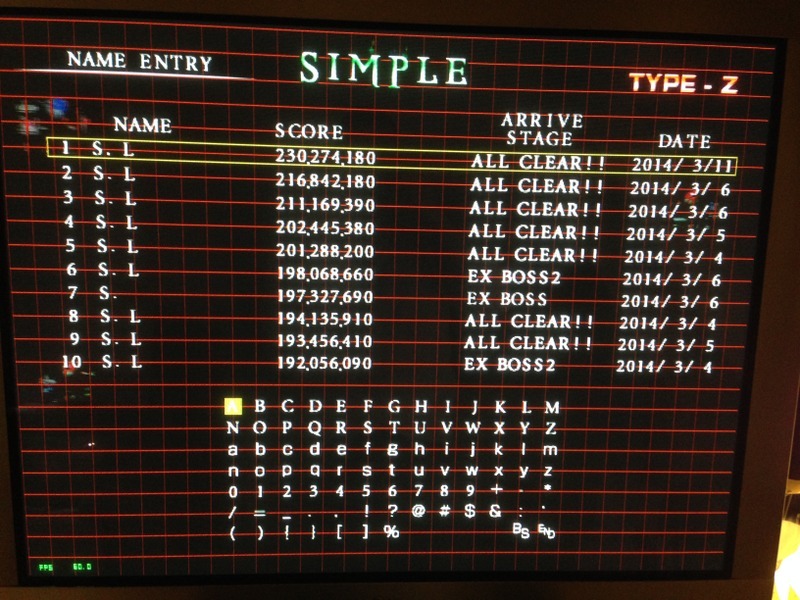 I've also managed a one-miss through all three last bosses, so it's just a matter of putting all the pieces together. Clearing with as many lives as possible will help greatly. I know you love Type I may I ask you why is it your favorite ship ? Any specific reasons ? I like Type Z the best, not really because it's stronger (ok a little bit ), but because it's very fast and fits more my type of agressive gameplay. 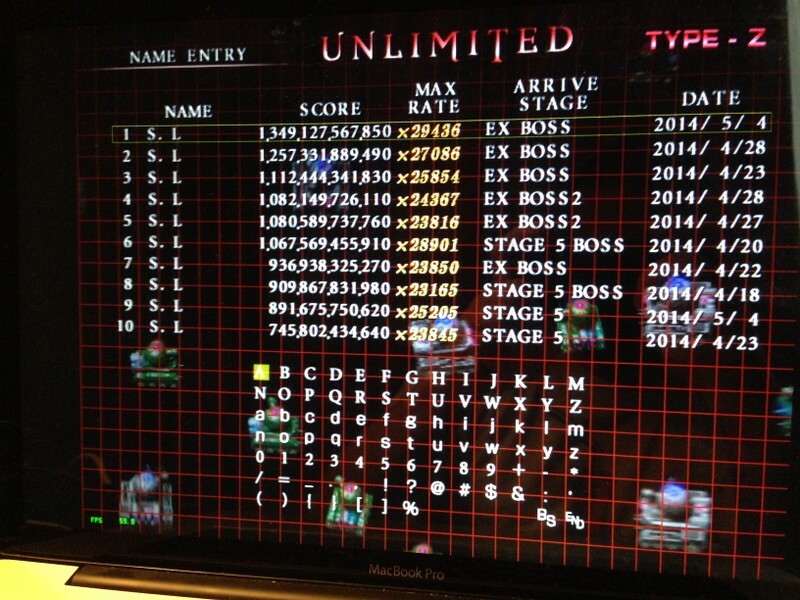 And final question, what's the highest known score on Unlimited with Type Z for western (humans) player ? I know you love Type I may I ask you why is it your favorite ship ? Any specific reasons ? I don't have a favourite. I play as Type I because I'm used to it and I optimise it better due to experience, and it suits my style of play (balanced scoring), but there are a lot of little scoring tricks you can do with Type II that you can't do with the other ships. Type Z I'm not too bothered about. I find it overpowered for Simple and Original, but for Unlimited it's about right. 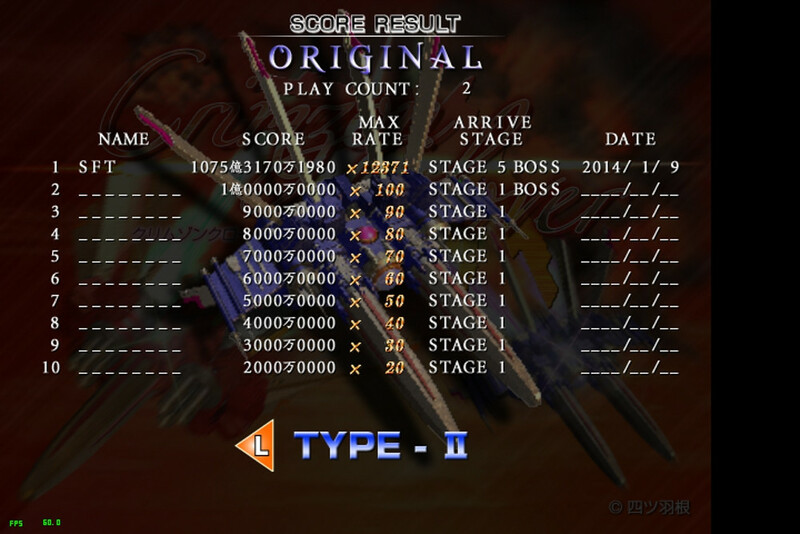 Although my score potential is probably estimated at between 1.8chou to 2chou for both Type I and Type Z, since I made a complete mess of stage 3 and 5 in my PB runs. 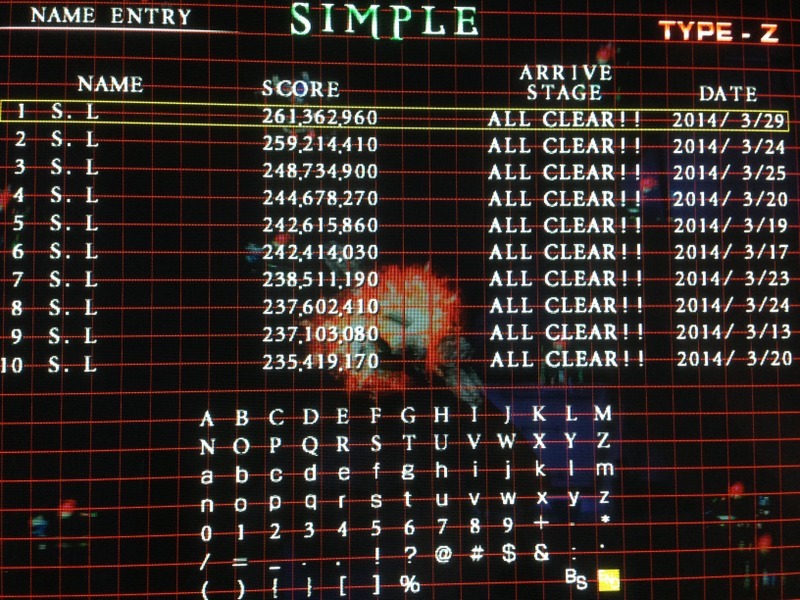 With practice and proper optimisation, I could manage 8000oku just from stage 3, for example (my PB stage with four deaths is 4951oku with Type Z). Both of them, coincidentally, ended either at the stage 5 midboss or a little bit after. Also note that there's a Japanese TAS replay that scores nearly 4chou with Type Z, so there's a whole lot more optimisation left in Unlimited. Thanks. That 1454oku Type I stage 1 run had a mistake at the end of it, and can be further optimised, as I was just testing an idea out then. I think 1600oku or more can be had. The most important thing is to have a long duration on your 6.4x multiplier during the fight, to keep Break Mode up. The 1313oku Type Z stage 1 wasn't as accomplished as I didn't attempt the lock-kill on a star carrier at the end, and ran out of timer on the 6.4x multipiler. That too can be optimised to 1600oku or more since Type Z can kill the boss quickly, maintaining a high Break Rate. More importantly, a lot of my stage routes have sections where I spend a lot of time maxlock-killing things to overdrive the Break Rate. It's definitely key in stage 3 and 5, where you can get upwards of 32,000 Break Rate in-stage. My best Unlimited run was a complete sloppy run, just my stage 5 saved me with a little bit more than 600 billions just with this one. I only pulled at max 2500oku from stage 5. Both runs had an okay stage 3 (about 4000oku), but decent 1 and 2 (3200oku or more total). Stage 4 is usually around 1500 to 1800oku, but I haven't experimented with milking the boss's second form yet. well, like I said this is not my favorite mode of the game, thou it is still very good of course. I could grab maybe an extra 100 millions (?) 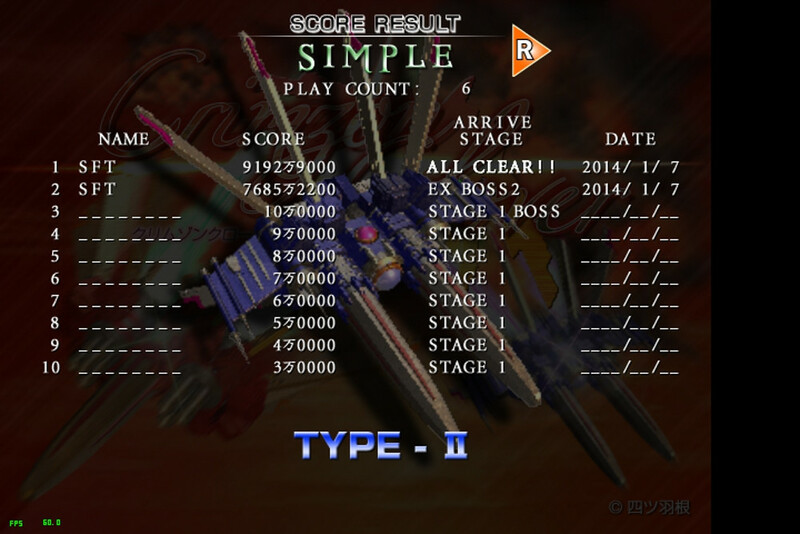 if I bother milking the stage 5 mid boss, but I think I'm not good enough (or patient enough) for that. :mrgreen: well, like I said this is not my favorite mode of the game, thou it is still very good of course. Like I mentioned earlier, Type Z is too powerful for Original, so you don't get nearly enough Break Rate and star items from using your Shot with it. The only way you'd be able to close in on my score is to either find a more efficient way to achieve high Break Rate with Z's power (highly unlikely), or learn to use I or II. That, and you need a really good stage 3 and a really good stage 5 route. I'm in the middle of learning to overflow SDOJ AC at the moment. I'll be back on this soon.